This listing is for two downloadable letter-sized 8½ x 11 PDFs, at 300 DPI and suitable for printing. Are you a busy person who could stand to look even busier? Or maybe you're like me, and you find it helpful to keep your hands busy, even when nothing noteworthy is taking place. These printable pages can be placed into any binder or discbound notebook to be used for personal notes. When you find yourself getting bored, you can color in the borders with pens, pencils, or even highlighters. Experiment with how many different shades you can get out of a #2 pencil! Try cross-hatching! The world is your oyster. These pages come in 'blank', with just the border, for doodling; 5mm lined, for standard note-taking; 5mm dot-grid, for graphs or other precise width work; and 2.5mm dot-grid, for very fine notes or very precise calligraphy. As a bonus, the second PDF is for anyone who doesn't want prying eyes peeping at their notes. The first integrates a standard pigpen cipher key into the border, making it easy to check against letters. The second also uses a pigpen cipher, but this time has the text 'the quick brown fox jumped over the lazy dog' repeated twice at both the top and bottom. The bottom text will always look upside-down, allowing you to orient pages however you'd like. Both of these bonus pages are 5mm dot-grid. This design can be printed on any letter-sized page. You may want to resize to fit the page when printing if you'll be using a three-hole punch; the default margins are an ideal width for discbound punches. Certain PDF readers and printer settings may cause the lines to have slight amounts of aliasing. I've have the best luck using Adobe Acrobat, but your mileage may very. Print onto regular copy paper to color with pencils, or onto cardstock to color with fine-point markers. 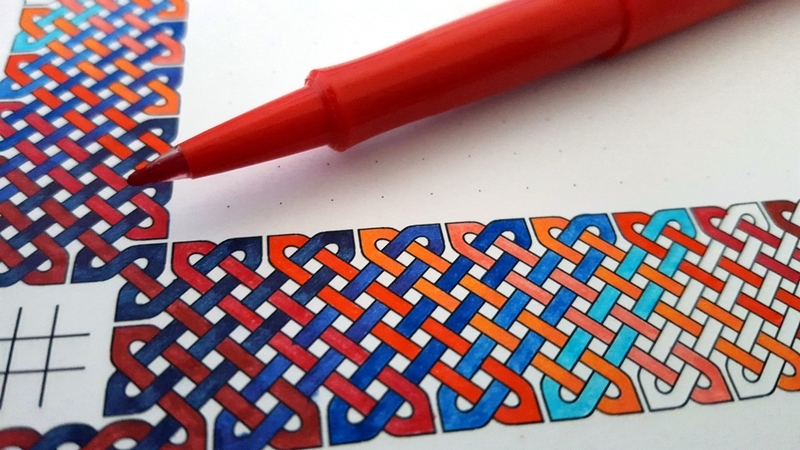 My knotwork coloring pages are intricate, tiny, and very advanced! That makes them unsuitable for colorers with poor fine motor control or any disabilities of the hand that could cause pain. I don't want anyone to hurt themselves trying to color these pages in! Take plenty of breaks, stretch your hands, and be careful of your posture. This coloring page is for personal use only. There are no watermarks, nor is there any text to distract from the knotwork. This means that there is no DRM or protection of any kind on this product! This is entirely on the honor system. I keep my prices low in the hopes that everyone who wants one can buy a copy of this coloring page. You may print this file as many times as you like, and share printouts with whoever you'd like. Just don't try to sell the finished colored pages, or present the knotwork pattern as your own. If you post a picture of your finished creation online, I'd love it if you tagged @KittyUnpretty or linked back to this listing (or both).